I’m going to be straightforward in two respects. The first truth is that it’s been about three weeks since I’ve seen Inside Job, so many of the film’s minute details are distant memories at this point. 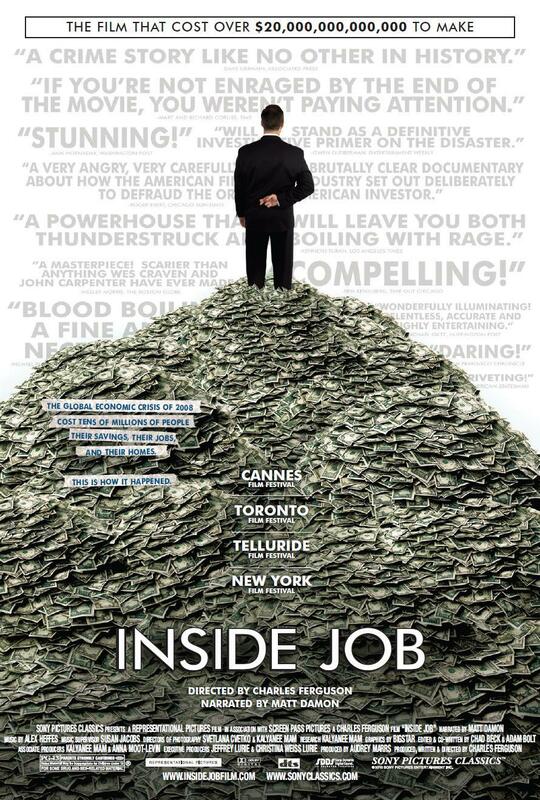 But that shouldn’t matter, because Inside Job is more about the emotions you feel during and after the film. The second truth is that this film will infuriate you beyond belief. It’s a film that transcends party lines because corruption is an all-encompassing virus that plagues every facet of the economic meltdown, so arguing that its approach is too liberal or conservative is a cop-out. The film has a slant, and definitely has a passion for its convictions, but it’s just as objective as it is embittered. It’s one of the most important films I’ve ever seen, but I didn’t enjoy a single minute of it. For those who don’t know, Inside Job tracks in great detail the corruption and greet that led to the 2008 Economic Meltdown, starting in the 1980s with the introduction of de-regulation. Everything that happens afterwards is a whirlwind of economic corruption and greed, explained as simply and straightforward as possible while indicting those who committed said crimes. Being that I’m no economics major, let alone a modest observer of Wall Street activities, 2008 was quite a shock to me. I knew of insider trading and defunct loans and all of the issues that the news channels were pining over, but when the crash eventually happened, I couldn’t have been any more dumbfounded. Suddenly friends and family that had saved and invested thousands were quickly being bled of funds, and the prospect of supporting myself (let alone a family in the future) became a very scary ordeal. Inside Job traces these events and the decades leading up to them with great and exacting detail. It’s almost too much to digest if you’re unaware of government policy and fiscal vocabulary, but the film presents it with such vigor and plain speak that even the most ignorant viewers (like me) would be able to understand them. Utilized are animated graphs and charts, talking heads, numerical figures and a steady narration by Matt Damon. I may not have been sure of 100% of the information given, but what matters in the end is not the intricacies of corruption, but the psychology of it. During the film, many of the country’s biggest financial advisors and leaders are placed on the spot and questioned as to their crimes. In many instances, the awkward pauses and stammered responses would be uncomfortable to watch, but here it’s simply infuriating. It’s an exercise in body language that the filmmakers (and the audience) master. From the humble beginnings of de-regulation during Reagan’s presidential term all the way to the selling of assets and liquidation of entire companies, these players were consistently gaining and stealing taxpayers’ money. Here, they’re questioned to the point of indictment over the various issues they’ve either condoned or advised over. Take for instance an interview done with former member of the Board of Governors of the Federal Reserve System Frederic Mishkin. His claim to fame is that he co-authored a report entitled “Financial Stability in Iceland” in 2006, citing that many of the country’s financials were incredibly strong and its infrastructure was stable. Within a year of that report being published, the country faced its economic meltdown (whose story acts as a preamble for the film). Mishkin was paid over $120,000 for that report. During the interview, Mishkin is asked about events like this and similar reports that have “ensured” our country’s stability. Very few of his responses are straightforward in nature, complete with stammers and pauses, but nevertheless he never breaks eye-contact with the interviewer. We know he’s lying. He knows he’s lying. But he does it and continues to do so without even so much as looking away. These guys may not have lying down to an art, but their brashness is on display more than ever. They either believe what they’re saying or they simply don’t care. I’d side with the latter. 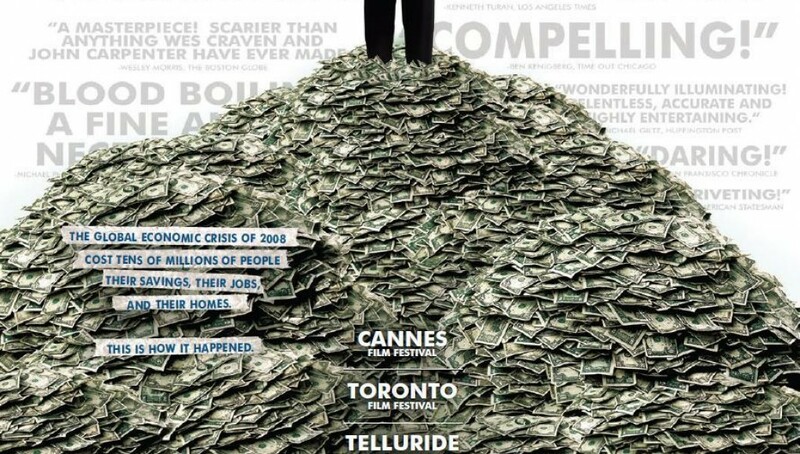 Many of the true heavy’s like Larry Summers and Ben Bernanke declined to be interviewed for the film. In their minds that was probably the wise choice, but in fact there’s no escaping the truth of any of these officials’ indiscretions. Whether they knew the gravity of their actions or were simply misguided by those advising them, they’re accountable for the meltdown of our country. I know the crux of my review has been on finger pointing, condemning officials and spouting vitriol. Quite frankly it’s hard to be objective when faced with a topic of such magnitude. How does the film sum up the events of the meltdown? Excellently. This is probably the most straightforward argument about the crisis that one is sure to see. Some may be struck by its anger as being biased, but as I said, how is one supposed to face this matter? With indifference and optimism? Director Charles Ferguson presents all of the information with vigor and bravery, knowing quite well that he’s made numerous enemies on Wall Street and Capitol Hill. Damon’s narration is stern yet calm. It’s not a surprise that he narrates the film, as Damon is often outspoken in these matters. Hearing his voice lends even more legitimacy to the proceedings, but regardless of the film’s all-American stance, there are some discrepancies that lie within the film. First, the credits cite only one researcher for the entire film. Now, the vast amount of information would take years to compile and would have needed to be done by a team of researchers. I’m not sure if only one is listed for the sake of time or credit space, but it’s worth noting either way (though I’m sure that none of the information is wrong). Second, while the film points fingers and argues for change at the highest level, it never offers a solution, instead asking the audience to do something about it. This point angered me greatly, but after further thought, I realized that there’s actually very little that could be done. With the shifting political climate and the changing of party lines, one would think that there would have been a washing of the Financial Sector, especially after the meltdown. But the fact of the matter is that the people who were in charge prior to the meltdown are still in charge. Those that have tried to bring reforms to the table have either been bought out or forced out, hushed by those who wouldn’t dare dreaming of losing their 10th yacht. Even if some of the advisors have moved on from the political realm, they’ve moved on the world of academia, teaching America’s brightest sponges that corruption is in fact legal. Larry Summers was the President of Harvard, and our friend Frederic Mishkin teaches business at Columbia. It’s as if the brass keep setting the dial to rinse and repeat, but continuously skip the rinse portion. It’s a bleak outlook, to be sure, but perhaps there are some things the regular viewer can do. For one thing, everyone should make it a point to become more educated on the matters at hand. In the future, our country’s Social Security fund will be dried up, and the ability to save for a hefty retirement will be nil and gone. These issues are not going to be cleared up any time soon, and unfortunately the next few generations will have to deal with the run-off of this depression. Invest smartly. Choose a company that you believe in and go with it. Don’t put all of your finances into the pot and don’t try to gamble it either, for the market is one of the most volatile sectors of the economy. If you play with fire, you will get burned. Be wary of banks. They are corporations, and their leaders are the main ones to blame for the mess we’re in. Keep an eye on how your invest your money and never be scared to save some in a jar for a rainy day (actually that may be terrible advice, but don’t think I haven’t started my own little pot). Sure, this may come with the taint of paranoia, but after this film, a little paranoia may be warranted. The fact of the matter is that the economics of this country will always be led by those whose greed outmatches the rest. There will be an end in sight one day, and there will be another bubble. But just when you think you’re in the clear, it will pop, and this will happen again. We’re taught to heed the mistakes of the past, and if any there’s film lays them out as plainly and competently as possible, it’s Inside Job. It’s the most important film I’ve seen this year. It’s the most important film I’ve seen this decade. See it wherever you can and take your friends and family with you. I URGE you to seek this out and heed its warnings. You will be angry, but anger incites change, and more than ever that’s what our country needs. It’s something we’ve been sorely lacking, even if the presidential campaigns tell you otherwise.